Bring a large pan of water to the boil, cook the potatoes for 5 minutes, drain and cool. In a large frying pan add the olive oil, red onion, curry powder and garam masala and cook for about 3 minutes over a medium heat. Now add the spring onions, potatoes and garlic and continue cooking for 5-7 minutes stirring every so often. You may need to add a little more oil if the potatoes begin to catch. Now add a 200ml of water, the peas and sultanas and continue cooking for another 5 minutes. Just before serving stir in the baby spinach. Slice the halloumi into 8 brush with a little olive oil and sprinkle with a little curry powder then cook either under a hot grill of in a dry frying pan over a hot heat. 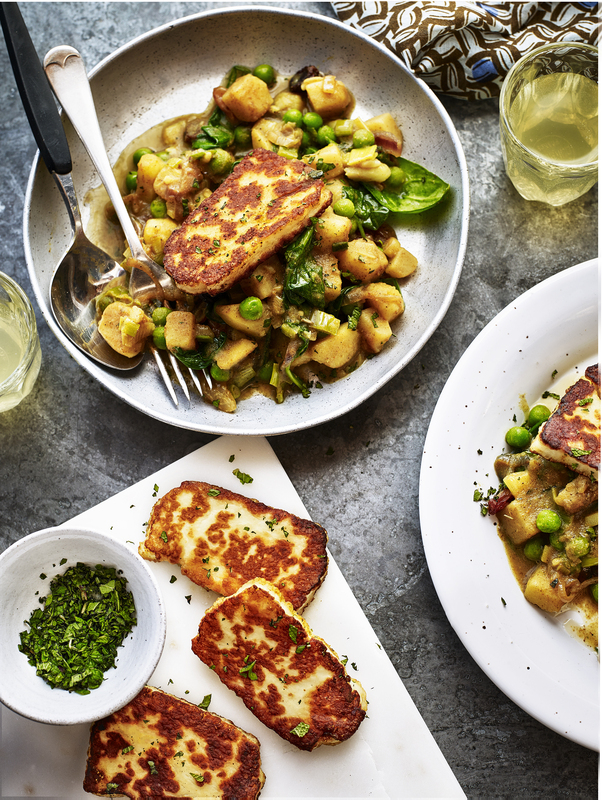 Divide the hash between your serving plates, top with the halloumi and finish with chopped fresh mint. Serve with crisp salad. Cook the potatoes in 200ml of hot water for about 5 minutes, drain. In a large microwavable bowl add the olive oil, onion, curry powder, garam masala, spring onions and garlic and cook for 3 minutes. Mix in the potatoes and peas and cook covered for about 10 minutes. Finally stir in the spinach and sultana’s and cook for 2 more minutes and serve with grilled halloumi cheese a scattering of fresh mint and crisp salad.